One of the pioneers in the Electronic Dance Music movement, pop trailblazer, superstar DJ and producer David Guetta will be back in Hong Kong this summer to celebrate his new album ‘Listen’. 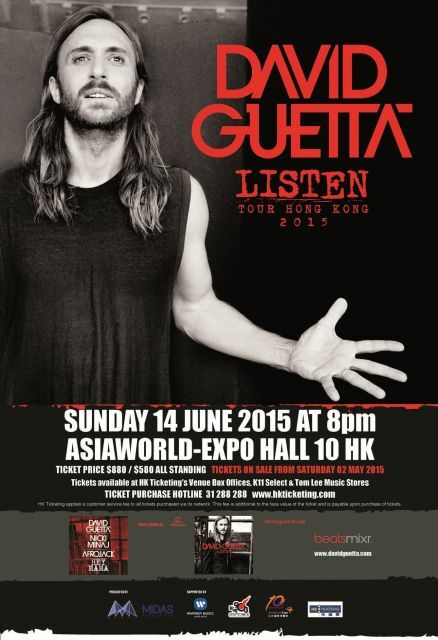 Dance music fans should not miss the live show David Guetta Listen Tour Hong Kong 2015 on 14 June 2015 at AsiaWorld-Expo. Now boasting over 3 billion views and 8.4 million subscribers on YouTube, 57 million Facebook fans and 5.8 million followers on Spotify – making him the most popular Spotify artist in the world, David Guetta has come a long way from his early DJ career in Paris. The unofficial godfather of the EDM movement released his sixth studio album Listen last November. The ambitious album saw David Guetta experimenting with elements of hip-hop, alternative rock, R&B and acoustic instrumentation. A genre-bending album, Listen features John Legend fusing acoustic soul with electronic production on the title track; Ms Dynamite and Swedish rapper Elliphant on reggae-house hybrid “No Money No Love”; The Script’s indie-dance crossover “Goodbye Friend”. Other talented artistes featured in the album includes Nico & Vinz and Sam Martin. And of course, Sia, who collaborated on the global smash “Titanium”, is back! The speaker-smashing track “Hey Mama”, a collaboration with Nicki Minaj and Afrojack has just earned David Guetta his first Billboard No. 1 in the Hot Dance/Electronic Songs chart this week (27 April). The album has already topped the iTunes album charts in 75 countries since its release last November and claimed No. 1 Dance Album spots in the US and the UK. David Guetta has sold over 9 million albums and 30 million singles. He was voted as the No. 1 DJ in the DJ Mag Top 100 DJs fan poll in 2011. Guetta has two Grammy Awards under his belt and has also won three 2011 World Music Awards, namely Best Producer, Best Music Video and Best Commercial Dance Track. And no DJ knows how better to throw a party! Be prepared for a night of crazy partying with David Guetta! Brought to Hong Kong by Midas Promotions, David Guetta Listen Tour Hong Kong 2015 will be held on 14 June 2015 at AsiaWorld-Expo. Tickets will be on sale starting 2 May 2015 at HK Ticketing’s Venue Box Offices, K11 Select and Tom Lee Music Stores. Ticket purchase hotline: 31 288 288, www.hkticketing.com.